As California continues to battle active wildfires, dozens of members of the NAGE and IAEP family have been affected. Over 30 members of the union’s EMS divisions have lost their homes to the flames that tore through their communities. Many of the first responders have been active on duty assisting their community members, patients, and neighbors despite their own devastating losses. The union is offering its support to any members displaced by the fires. National President David J. Holway reports that NAGE Charities will be offering a donation to any NAGE members displaced by the fires. 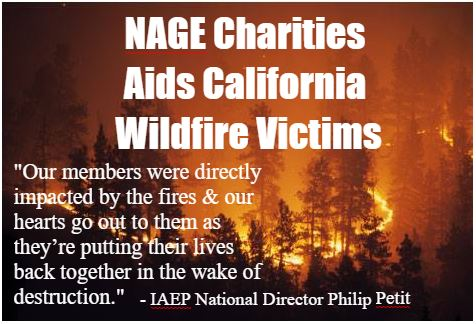 “Many of our members were directly impacted by the fires around the state of California and our hearts go out to them as they’re putting their lives back together in the wake of this destruction,” said Philip Petit, National Director for the IAEP and NAGE EMS. The union encourages any of its members affected by the wildfire to reach out to their local union leaders. Please join us in keeping all emergency personnel in your thoughts and prayers. You can donate or learn more about NAGE Charities by clicking here, or via email at msheehan@nage.org. Pictured here: Local President Donavan Ruttan accepting a check from NAGE Charities with National Representative Dary Sardad for IAEP/NAGE members who lost homes in the wildfires. Local President Donavan Ruttan accepting a check from NAGE Charities with National Representative Dary Sardad for IAEP/NAGE members who lost homes in the wildfires. Michael Diaz, Local R12-77 President and Treasurer Paul Prober present a check from NAGE Charities to members Justin and Emily, members affected by the recent wildfires in California.